From Norman times St Nicolas was a subsidiary chapel of Bromsgrove.It was only in 1846 that Kings Norton became an independent parish. 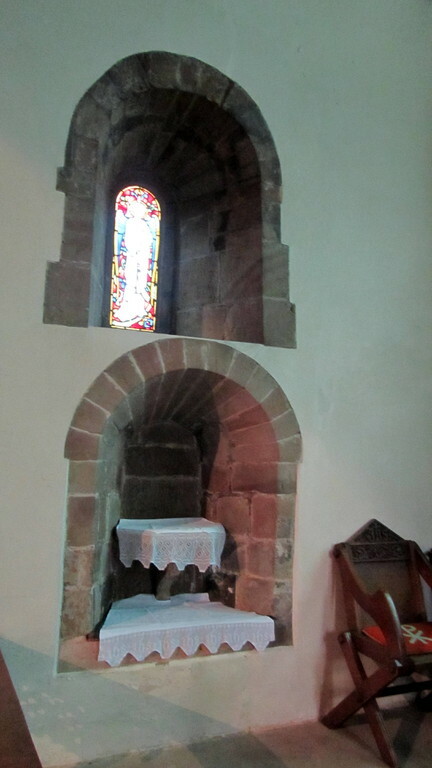 A Norman window in the chancel is evidence of the church's 900 year-old history. 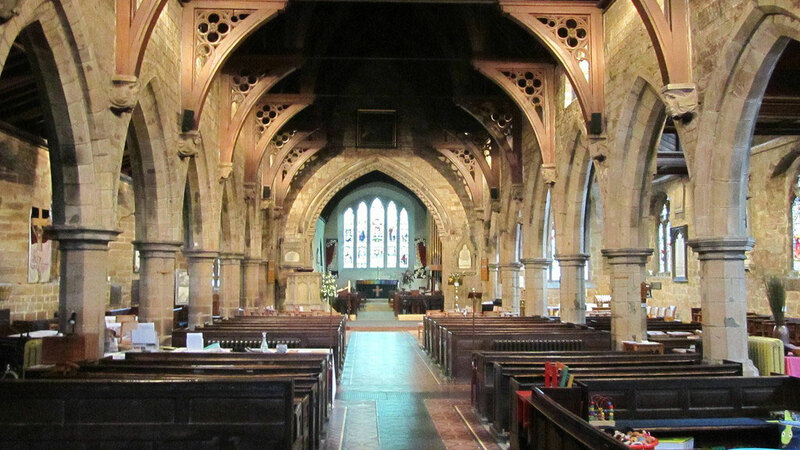 The church's own website, The Parish of Kings Norton, is at - http://www.kingsnorton.org.uk/. See also A Church near You - http://www.achurchnearyou.com/kings-norton-st-nicolas/. You might also be interested in A History of Birmingham Places & Placenames . 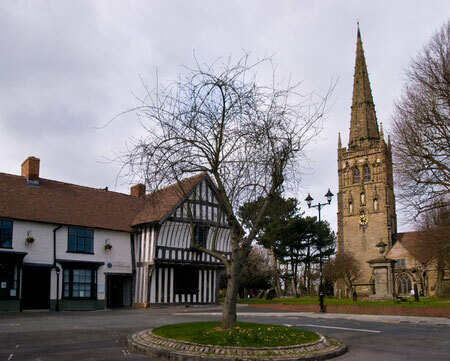 . . from A to Y - Kings Norton - http://billdargue.jimdo.com/placenames-gazetteer-a-to-y/places-k/kings-norton/. At the time of the Domesday Survey in 1086 Kings Norton was a berewick of the manor of Bromsgrove. A berewick was an outlying estate owned by and part of the manor. However, before the 13th century it seems to have been held as a separate manor, but following the same descent as Bromsgrove until 1564, when the that manor was sold off by Queen Elizabeth I.
Kings Norton, however, remained a royal manor (hence its name) until the beginning of the 19th century. In 1804 the manor was bought by John Taylor. It is thought that his descendants continue to hold it. Set in the north wall of the chancel are two of the original round-arched Norman windows which are over nine hundred years old. 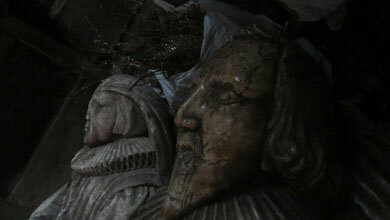 They were rediscovered during the restoration of 1863 and are certainly not in their original positions. The one has been opened up as a window while the other immediately below it is now in use as a communion credence. 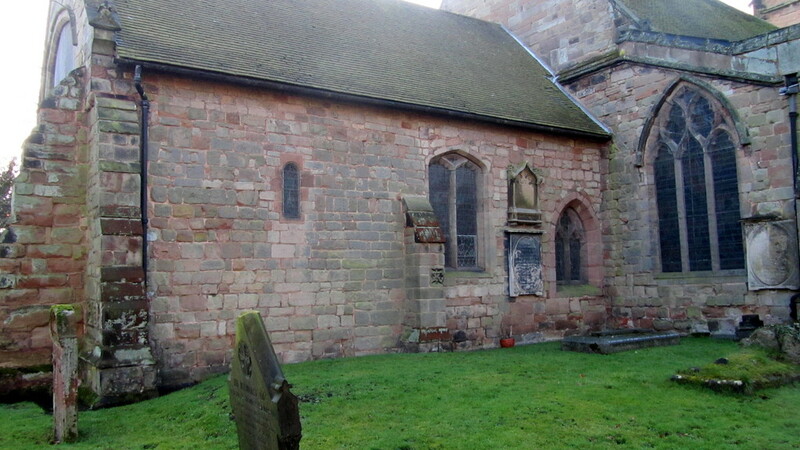 The small 11th-century church, which stood on the site of the present chancel, was rebuilt in late 13th- and again in the 14th century of local sandstone. The south aisle and arcade were added at this time. 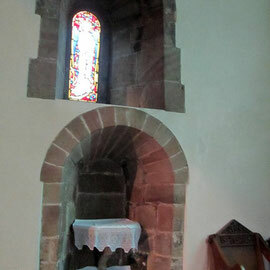 The chancel arch is 14th century and has two orders of decoration, the inner having good ballflower ornament. The chancel itself was either built or rebuilt and extended, though its present appearance dates from the 1863 restoration. The tower with its embattled parapet and fine octagonal crocketed spire and may be the work of Henry Ulm who also built the towers at Sheldon and Yardley. The south porch and doorway are 15th-century. St Nicolas' Church is a Grade I Listed building. In 1615 the church roof was raised by the addition of a clerestory and the unusual gabled roofs. This may have been done to accommodate galleries to provide additional seating. These developments testify to a prospering local community here during the Middle Ages probably rearing sheep and profiting by trading in wool. Northeton is a praty uplandyshe towne in Warwike-shire [actually in Worcestershire], and there be some faire howsys in it of staplears, that use to by wolle [wool merchants]. There is a faire churche and a goodly piramis of stone over the bell frame. There rennithe a litle brooke [the River Rea] at the est end of the towne. Good plenty of wood and pasture and meatly good corne betwixt Alchirch [Alvechurch], and Northton. And lykewise betwixt Northton and Bremischam [Birmingham] that be distaunt from othar 5.miles. Major restoration which was undertaken in 1872 to regothicise the church included the removal of the 18th-century box pews and low ceilings. From the ground floor of the tower can be seen a small door half way up the wall, evidence of the existence of a gallery here. The present appearance of the church dates from this time. There is little doubt that during the 18th century the fabric of many church buildings had been allowed to decay, although the extent to which this is true is unclear: many cases can be shown where buildings were well-maintained. 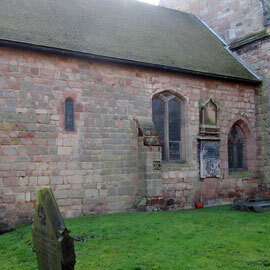 Dr Prattinton noted in 1826 decay in the fabric of Kings Norton Church believed to be caused by vaults under the church. The decay had existed since before 1712, that being the date on buttresses supporting the north wall. After three restorations a fourth was necessary in 1872 to address the dangerous condition of that wall and cracks in the tower. 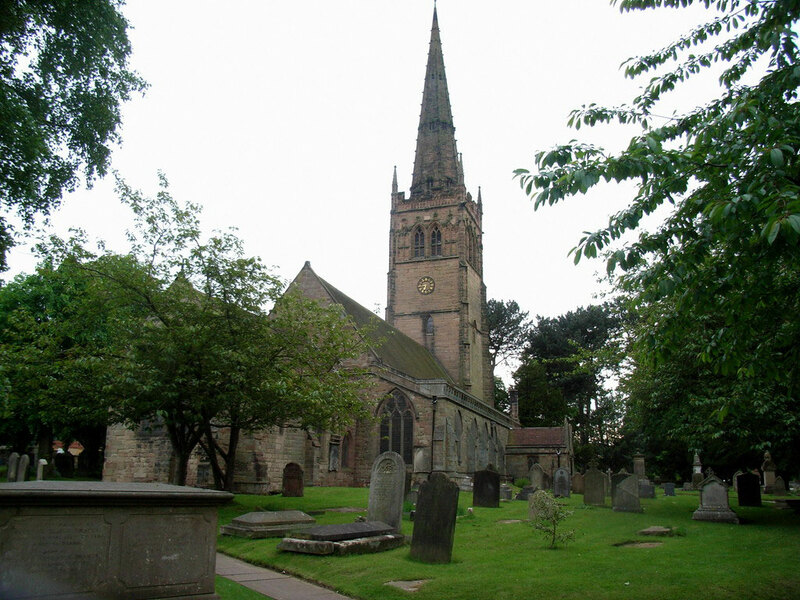 Kings Norton Church underwent three restorations during the 19th century before 1872 which resulted in the gable windows being blocked, flat ceilings inserted into the aisles and nave, and the south aisle wall lined with lath and stucco, all 18th-century characteristics. Later surveys revealed deterioration of the fabric. The north wall had no foundation and, rather than address the underlying problem, buttresses had been built which were now pulling the north arcade out of true. The tower was held in places by iron ties. The church is less substantially restored than those by Chatwin and yet it has left a controversy which runs to the present. Parts of the church were thought unsafe and ‘the original plan of the building (had) . . . been encrusted by unsightly additions’, typical 18th-century alterations which continued into the 19th-century restorations. In 1870 W J Hopkins surveyed the church and found cracks in the tower, serious problems with all the roofs and the north arcade out of true. He recommended careful restoration ‘in accordance with the original design’. This was conjectural, but he detailed the removal of the gabled aisle roofs which were out of keeping and their replacement with lean-to roofs, raising the roof by ten feet to give a steeper pitch, demolishing a brick vestry and stripping the plaster walls. He was keen to re-use roof timber if possible and to demolish nothing, the north arcade in particular, unless absolutely necessary. Internally the chancel was cleared of pews, round-headed windows were replaced with pointed lancets and the newly discovered Norman windows restored. The Georgian ceilings were removed and the box pews cut to size as bench pews. Private donations paid for the church to be later fitted out ecclesiologically with encaustic tiles in a chancel cleared of monuments, a new organ was put in place, stained glass windows, a brass eagle lectern, new font and statues for the niches in the tower. The walls were stripped of plaster. A belief propounded regularly in The Ecclesiologist was that pre-Reformation churches had bare stone walls. During restoration the walls of ancient churches were often stripped of plaster and the joints pointed. The Ecclesiologist gave practical information on how to strip whitewash. However, examples were also given of wall paintings found in ancient churches, and these were done on plaster. In Birmingham pre-Reformation wall paintings were found during restoration at St Martin-in-the-Bull Ring and at Yardley. Indeed, the Ecclesiological Society wanted to see old paintings restored and new ones where they had not previously existed. The Society for the Preservation of Ancient Buildings SPAB was nicknamed ‘The Anti-Scrape’ and protested vehemently against the removal of whitewash and plaster: ‘Ancient buildings from earliest times have been finished with stucco and plaster, which was invariably whitened’ The raised joints of which restorers were so proud were ‘pure barbarism.’ At Kings Norton evidence of wall paintings was also found including the Last Judgement over the chancel arch, but these were destroyed when the walls were stripped. James Holliday was appalled but felt that at least the paintings would not be subject to a renovation which was worse. Following the restoration, church press releases and newspaper reports emphasised the urgent need for structural repair, the care taken in restoration and the appropriateness of new additions. The dangerous north aisle wall was rebuilt on concrete foundations and the leaning north arcade was carefully taken down and rebuilt using the old materials in their former positions. The gabled roof was replaced by a lean-to roof in 14th-century style with a parapet based on existing traces and by comparison with that at the top of the tower. The nave roof was built on hammer-beam principles. It may be that funds were insufficient for the south aisle gables to be replaced, and being sound they were not a priority and still remain. James Holliday, a member of SPAB from the beginning and their local correspondent argued that nothing should have been done to alter the existing church. He argued that every detail of the restoration was inaccurate anyway. The lean-to roof was not in 14th-century style but should have been a ridge, the coping of the parapet had no precedent, and the nave roof was too elaborate and 15th-century in style with 14th-century pitch. Worse was the hammer-beam nave held together with iron ties; original hammer-beam roofs were designed to be self-supporting to obviate the necessity of ties. New stone corbels supporting the roof ‘might be supposed to have been bought by the gross, so poor and mechanical are they in design and execution.’ Windows in the north aisle had been needlessly altered and a sound old doorway replaced by a modern one. There are a number of good memorials here. Inside the church a worn slab commemorates the chantry priest Humfrey Toye who died in 1515. The splendid Greaves tomb with effigies of Sir Richard and Lady Anne was originally in the chancel but was moved under the tower during the 1872 restoration. In the churchyard is the monument of the Middlemores, a family long associated with the manor. This church is noted for its good ring of ten bells. Bells were first hung in the tower when it was built in the mid-15th century. In 1783 the existing six were replaced by a ring of eight. One of the earlier bells dated 1689 still stands at the back of the church. The bells were recast in 1926 by Taylor's of Loughborough and two more were added to make the present ring of ten. Historic England website - https://historicengland.org.uk/listing/the-list/list-entry/1075549.